EAG is your R&D partner, working with aerospace and defense manufacturers and suppliers to create faster, safer and more reliable aircraft and components. We use the most advanced analytical methodologies to answer complex engineering, materials and manufacturing problems, from evaluating the purity of new materials to confirming the characteristics of ceramic matrix composites. For research, development and production, we work alongside your technical staff to formulate and troubleshoot the next generation of aerospace and defense materials. For over 50 years, EAG’s scientists have applied advanced analytical techniques to solve tough problems and support R&D activities for manufacturers and users of a wide variety of chemicals and materials. EAG offers reliable analytical results, development support for novel products, and answers to complex problems for manufacturers of chemicals used in metals, fibers, plastics, coatings, adhesives, construction materials, textiles, lubricants and more. Consumer products manufacturers and partners turn to EAG to answer R&D questions, ensure supply chain quality, respond to regulatory requirements and ensure well-supported legal arguments. EAG scientists have helped all types of consumer products companies accelerate innovation, resolve manufacturing concerns and comply with evolving regulations. Drive R&D productivity and keep pace with evolving environmental regulations. From agrochemical development to evaluating innovative packaging solutions, EAG scientists support the agriculture/food s industry with scientific expertise required to enhance shelf life, ensure product safety and understand environmental impact. Whether in need of food quality investigations or help supporting regulatory filing of new chemicals, ask EAG. WE KNOW HOW. When a business’s brand and reputation is at stake, clients turn to EAG’s litigation support services for dependable scientific answers. Since 1959, our scientific expertise, testing and testimony have supported legal strategies for intellectual property, product liability and insurance cases. Our scientists offer expertise in technology, life sciences, electronics, industrial and consumer products, having tested a broad array of materials for legal challenges. We understand the unique needs of legal projects – speed, effective communication, reliability and confidentiality. From initial concept and prototypes to verification/validation, submission and launch, EAG Laboratories is your partner in medical device development. From implant biocompatibility studies to surface chemistry for contact lenses, we have the experience and techniques to characterize, test and assure purity of medical devices and their materials, components, products and packaging. By utilizing our unique expertise in materials sciences, chemistry, electronics and regulatory support, EAG empowers device companies to create new ways to heal and improve patient quality of life. Overcome R&D roadblocks with technical and regulatory know-how. For over two decades, EAG scientists have helped solve complex issues for the pharmaceutical Industry. Using multidisciplinary science and engineering, we help improve product development efficiency, avoid regulatory setbacks and uncover sources of problematic manufacturing issues. From GLP and cGMP studies to contaminant and packaging investigations, the scientists of EAG support every phase of the product lifecycle. When it comes to understanding the physical structure, chemical properties and composition of materials, no scientific services company offers the breadth of experience, diversity of analytical techniques or technical ingenuity of EAG. From polymers to composites, thin films to superalloys—we know how to leverage materials sciences to gain a competitive edge. At EAG, we don’t just perform testing, we drive commercial success—through thoughtfully designed investigations, technically superior analyses and expert interpretation of data. Whether connecting the internet of things, guiding surgical lasers or powering the latest smart phone, integrated circuits and microelectronics touch nearly every aspect of human life. In the world of technology, innovation and continuous improvement are imperatives—and being able to quickly and reliably test, debug, diagnose failures and take corrective action can make the difference between a doomed product launch and building a successful global brand. EAG offers you the world’s largest and most diverse collection of specialized analytical instrumentation, capacity to perform a variety of microelectronic tests in parallel, and the multi-disciplinary expertise required to draw true insight from data. When you need solid science and investigative engineering to address product failures, inform legal strategy, protect intellectual property or address product liability disputes, turn to EAG. We’ve provided technical consulting, analysis and expert testimony for hundreds of cases involving the aerospace, transportation, medical device, electronics, industrial and consumer product industries. Our team of experts understands the legal process and your need for responsiveness, effective communication, scientifically defensible opinion and confidentiality. From professional consulting to data review to trial preparation and expert witness testimony, ask EAG. EAG Laboratories’ pharmaceutical development services group is now part of Eurofins Biopharma Product Testing. Eurofins BioPharma Product Testing offers unprecedented, multi-location capacity and unmatched expertise through the largest harmonized network of bio/pharma product testing laboratories worldwide. From performing IND-enabling studies to full CMC analytical and QC support, we join your R&D team as a true partner, providing expert guidance to balance regulatory expectations with expediency and cost, and approach technical challenges with flexibility and resolve. Having helped develop the test methods that shape current regulatory guidelines, EAG chemists, biologists and toxicologists have evaluated the environmental impact of thousands of active ingredients and formulations—from pesticides and pharmaceuticals to industrial chemicals and consumer products. Whether you are exploring “what if” scenarios, registering a new active ingredient or formulation, responding to a data call-in or seeking to understand the latest guidance, turn to EAG for technical excellence, sound advice, GLP-compliant study execution and expert interpretation. EAG combines biotechnology and protein characterization expertise with more than 50 years’ experience analyzing chemical compounds in plant and environmental matrices to address the growing needs of the biotechnology crop industry. We offer a wide range of techniques required to fully characterize the event insertion and expressed proteins, as well as the various studies required to confirm the food, feed and environmental safety of products that represent the trait. From early-stage protein confirmation to GLP-compliant EDSP and allergenicity testing, we help you make faster, more informed development decisions and comply with evolving global regulations of genetically engineered crops. No contract service provider has more experience performing custom synthesis and producing isotopically labeled compounds to support product development in life science, chemical and related industries than we do. From 14C and 3H radiolabeled clinical trial materials synthesized under cGMP, to stable-labeled active ingredients for metabolism and environmental fate/effects testing, turn to EAG. We have extensive experience with multi-step and other complex synthesis projects, and our comprehensive, in-house analytical services ensure quick turnaround of purity and structural confirmation. Using an array of advanced separation techniques and innovative technology, we conduct highly precise analytical chromatography for various industries. Whether you want a closer look at the purity of your pharmaceutical or need to better understand an agrochemical’s components, EAG has the expertise to separate and evaluate any compound. Need to evaluate the molecular structure of a compound or identify its origins? EAG knows how. With state-of-the-art tools, we can separate, vaporize and ionize the atoms and molecules in almost any pure or complex material to detect and obtain mass spectra of the components. We rely on decades of experience in mass spectrometry to provide our clients with precise analyses and the best detection limits. EAG is a world leader in high-resolution imaging down to the atomic level. We offer unmatched analytical know-how, generating extremely detailed surface and near surface images for various industries, from consumer electronics to nanotechnology. Using state-of-the-art equipment and innovative techniques, we conduct expert imaging to aid in failure analysis, dimensional analysis, process characterization, particle identification and more. If you want to investigate a material with angstrom scale resolution, you can count on EAG to get the job done quickly and precisely. EAG offers a vast array of spectroscopic techniques to clients in various industries, from defense contractors to technology pioneers. We combine unparalleled expertise and methodology with cutting-edge technology to analyze your organic, inorganic, metallic and composite materials for identification, compositional, structural and contaminant information. Whether you need expert spectroscopic analysis to improve your production process or to surmount a technical challenge, EAG is up to the task. Need to identify your unique material? Want to analyze the thermal properties of a sample, or measure the success of a process step? If it has to be done quickly and it has to be done right, you can count on EAG. We offer a range of adaptable techniques and innovative methods to evaluate the physical and chemical characteristics of any compound. Our highly precise testing and analytical services will improve your production process, expedite R&D and help you conquer any technical challenge. One of the most respected names in contract research and testing, EAG Laboratories is a global scientific services company operating at the intersection of science, technology and business. The scientists and engineers of EAG apply multi-disciplinary expertise, advanced analytical techniques and “we know how” resolve to answer complex questions that drive commerce around the world. Science and technology transcend industry boundaries, and so does demand for EAG’s expertise. We partner with companies across a broad spectrum of high-tech, high-impact and highly regulated industries. We help our customers innovate new and improved products, investigate manufacturing problems, perform advanced analyses to determine safety, efficacy and regulatory compliance, and protect their brands. EAG’s corporate culture is firmly rooted in four guiding principles: “foster a growth mindset,” “find a better way,” “earn more loyal customers,” and “win together.” Across all of our 20+ locations, you will find a true passion for science and the power of science to improve the world we live in. Hear what some of our ~1200 scientists, engineers and support personnel say about what it means to be part of EAG Laboratories. EAG is growing, and we are always looking for talented, problem-solving oriented individuals to join our company. If you have a “we know how” spirit, we want to hear from you. Browse current openings now, and re-visit our careers page often. WHY EAG FOR ADVANCED MICROSCOPY SERVICES? EAG Laboratories provides the specialized support and services you need to accelerate time to market, fill equipment and expertise gaps, and manage risk associated with product development. We have a broad range and large installed base of different microscopy tools and services to match your application, ranging from process development to failure analysis. In addition to providing high resolution imaging, our analytical capability makes us a unique partner that can help you during research, development, and analysis of failures. We can perform structural and cross-sectional analysis, elemental material analysis, and microanalysis with sub-nanometer spatial resolution. Transmission Electron Microscopy (TEM) and Scanning Transmission Electron Microscopy (STEM) are closely related techniques that use an electron beam to image the internal structure of a sample. High energy electrons, incident on ultra-thin samples allow for image resolutions that are on the order of 2Å. Compared to SEM, TEM and STEM have better spatial resolution and are capable of additional analytical measurements, but require significantly more sample preparation. Although more time consuming than many other common analytical tools, the wealth of information available from TEM and STEM analyses is impressive. Not only can outstanding image resolution be obtained, it is also possible to characterize crystallographic phase, crystallographic orientation (by diffraction experiments), produce elemental maps (using EDS or EELS), and obtain images that highlight elemental contrast (dark field STEM mode). These can all be done from nm-sized areas that can be precisely located. STEM and TEM are the ultimate failure analysis tools for thin film and IC samples. EAG has recently added an Aberration Corrected-STEM instrument to provide the best available image resolution from a commercial independent microscopy service. Scanning Electron Microscopy (SEM) provides high-resolution and large-depth-of-field images of the sample surface and near-surface. SEM is one of the most widely used analytical tools due to the extremely detailed images it can quickly provide. Coupled to an Energy Dispersive X-ray Spectroscopy (EDS) detector, SEM also offers elemental identification of nearly the entire periodic table. SEM is used in cases where optical microscopy cannot provide sufficient image resolution or high enough magnification. Applications include failure analysis, dimensional analysis, process characterization, reverse engineering, and particle identification. Our highly skilled staff enables you to meet the desired outcomes. Person-to-person service ensures good communication of the results and their implications. Customers are often present during the analysis, enabling an immediate sharing of data, imaging and information. A Focused Ion Beam (FIB) instrument uses a finely focused ion beam to modify and image the sample of interest. FIB is chiefly used to create very precise cross sections of a sample for subsequent imaging via SEM, STEM or TEM or to perform circuit modification. Additionally FIB imaging can be used to image a sample directly, detecting emitted electrons either from the ion or electron beam. The contrast mechanism for FIB is different than for SEM or S/TEM, so unique structural information can be obtained in some cases. A dual beam FIB/SEM integrates these two techniques into one tool, facilitating “cut and look” studies. FIB has revolutionized sample preparation for TEM samples, making it possible to identify sub-micron features and precisely prepare cross sections. FIB-prepared sections are used extensively in SEM microscopy, where the FIB preparation, SEM imaging, and elemental analysis can happen on the same multi-technique tool. FIB-prepared sections are also used in Auger Electron Spectroscopy to provide elemental identification of subsurface features quickly and precisely. It is an ideal tool for examining products with small, difficult-to-access features, such those found in the semiconductor industry and for sub-surface particle identification. It is a good option for products that are hard to cross section, such as soft polymers that are challenging to polish. EAG works with a wide range of materials and regularly assists companies with FIB sample preparations and analyses. No other lab can match EAG’s skill set, experience, and fleet of instruments. Plus, you can count on fast turnaround times, accurate data, and person-to-person service, ensuring you understand the information that you receive. 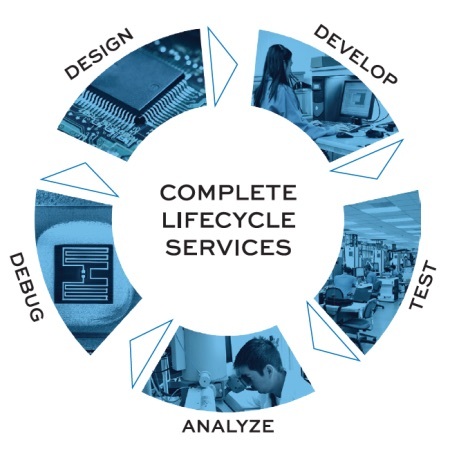 EAG delivers comprehensive design, development, test, analysis and debug services that are differentiated by expert engineering capability and comprehensive capital equipment and processes. Send me periodic updates from EAG. I can unsubscribe at anytime. Yes No Send me periodic updates from EAG. I can unsubscribe at anytime. To enable certain features and improve your experience with us, this site stores cookies on your computer. Please click Continue to provide your authorization and permanently remove this message.